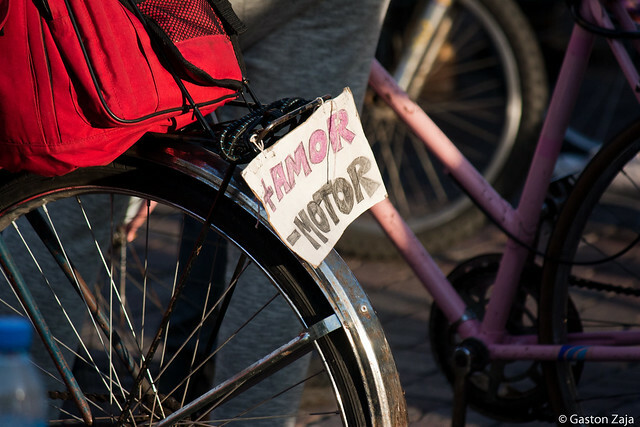 Bicycles, fashion shows, live music and more will all be part of the Buenos Aires Bicycle Fest that will be held this weekend, on the 27th and 28th of October at various city venues including the Planetarium, the Parque Centenario, Rosedal and Distrito Audiovisual. The event seeks to promote the bicycle as a means of transportation in the city. Some of the top activities planned for the weekend include two fashion shows at the Planetarium, starting at 6.30pm, thematic city bike tours, live music at the Anfiteatro del Parque Centenario, various conferences regarding new transport trends and other bike related themes, a special platform for freestylers to show off their bike pirouettes, games for children, bike mechanic workshops, special projections and art interventions at the Planetarium and Distrito Audiovisual, amongst others. Find the full program of activities here. This entry was posted in Buenos Aires Agenda, Where to Go, What to Do and tagged argentina, Bicycle festival, buenos aires,, exhibits, Live Music, October, Palermo, parque centenario, Planetarium, recoleta, Rosedal, Spring, weekend, workshops by Fierro Hotel Staff. Bookmark the permalink.